The daughter of Juan Manuel Pérez de Guzmán, duke of Medina Sidonia, Luisa Maria Francisca de Guzmán y Sandoval was the wife of a king, the mother of two kings, and the mother of a queen--she was also regent of Portugal from 1656 to 1662. In 1633, Luisa de Guzmán married John, duke of Braganza, who became king of Portugal in 1640 after the Portuguese revolution began, ending the sixty-year rule of the Habsburgs in the kingdom. Despite her Spanish birth, the new queen urged her husband to take the throne and to resist the power of Spain. 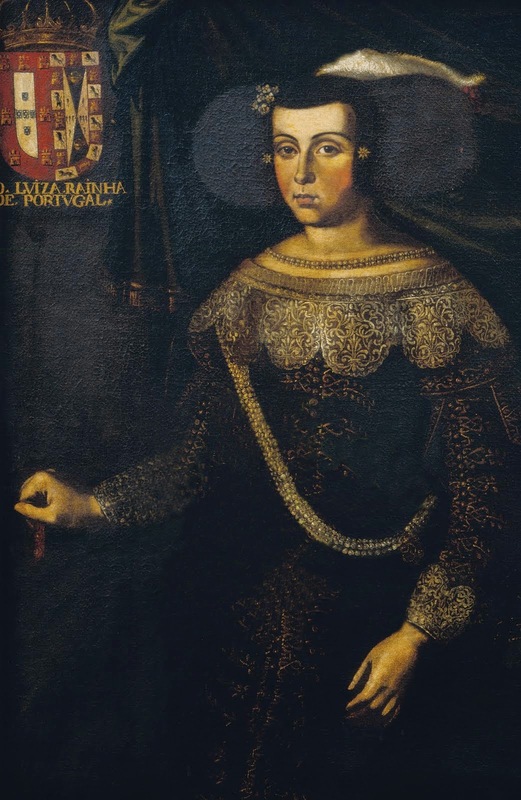 During the protracted conflicts, skirmishes, and raids that followed--the Portuguese Restoration War--Luisa remained politically active, particularly when the king was away from Lisbon. When King John IV died in 1656, Queen Luisa became regent of Portugal for her minor son, thirteen-year-old Afonso VI--because of his physical and mental disabilities (he had suffered a childhood illness that had resulted in paralysis on the left side of his body and some kind of mental instability), the queen remained as regent. Finally, in 1662, convinced by a favorite that his mother was scheming to permanently rule and to exile him from Portugal, Afonso decided to exile his mother instead--she was forced to retire to a convent. Hearing that his mother was dying and wished to see him, Afonso delayed, arriving at last three days after her death on 27 February 1666. While she was regent of Portugal, Luisa arranged for her daughter Catherine of Braganza's marriage to the English king Charles II. And despite his physical and mental impairments, Afonso VI married in 1666, though after sixteen months of marriage, his wife filed for an annulment on the basis of non-consummation. In 1668, Afonso's younger brother, Peter, had himself named as regent of Portugal, then deposed and banished the king (who lived in exile until 1683), and, finally, married his brother's wife, Marie Françoise of Savoy (who participated in the coup that removed Afonso from the throne). When Afonso died, Peter succeeded him as king of Portugal. So, Luisa de Guzmán: wife of a king, mother of two kings, mother of a queen. But also a woman who ruled. For a biographical essay from the Portugal: Dicionário Histórico, Corográfico, Heráldico, Biográfico, Bibliográfico, Numismático e Artístico, click here.